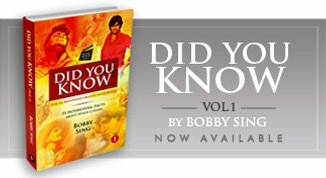 In the latest Bollywood trend of making biopics belonging to different genres, we have seen films on sportsmen, criminals and even actors successfully making an impact on the audience with their entertaining content. However, post PAAN SINGH TOMAR, here is yet another film with a real life story that cannot be discussed with any kind of proud at all since it strongly makes us feel the shame knowing the treatment given to our respected aged elders who had actively participated in the nation’s collective struggle of independence before 15th August 1947. In 1987, director B. R. Chopra came up with a thoughtful idea portraying the changing personas of a few veteran freedom fighters in the new independent India in his multi-starrer AWAM. The average film was not accepted well by the audience despite a big star-cast, but it did present a pretty balanced depiction of the issue dividing the freedom fighters of the country into two broader sections as per the reality. In the first section, it had those ‘corrupted by power’ weak and greedy opportunist people who took all the advantage of being freedom fighters post-independence, whereas in the second it focused on those pure, optimistic souls who still remained freedom fighters only even in the free India, searching for that dream country they had been fighting for in their prime youth. Taking the same thought forward, GOUR HARI DASTAAN actually brings into light a third division in that category, further putting us all to shame like never before. And this third form talks about an old, uncorrupted, truthful freedom fighter, living his life on the simple yet strong principles of Mahatma Gandhi, who is denied being given his hard earned respected status of a freedom fighter by the officials (for 32 long years), and instead is tagged as ‘A Fraud’ by everyone around for their own distinctive reasons and hidden interests. A simple and honest cinematic presentation of a real life story of Odiya freedom fighter Gour Hari Das, this is an ‘eye opener’ film that has been thoughtfully written (dialogues) by the renowned journalist C. P. Surendran and beautifully directed by Ananth Narayan Mahadevan, more known for his acting assignments among the general audience. The unfortunately true story has been presented with a subtle satire and the hurting pain constantly felt by its main protagonist and his old wife together. But above all it has an engrossing progression with a touch of humour too along with many brilliant performances led by the talented couple playing two surprising roles. But why I have quoted them here as ‘playing surprising roles’? That’s because I honestly didn’t expect ‘them’ to play the lead pair so perfectly. Sharing more about this misconception of mine with an interesting anecdote, I first saw the poster of the film at Facebook having a sad feel or tone a few months back. And looking at the artwork I honestly couldn’t recognize the bald man’s face in it and took it as a film made on yet another untold story from our countrywide freedom struggle on the lines of CHITTAGONG. Later though I kept reading about many regular updates on the film’s continuous praises received at various film festivals around the world but somehow still couldn’t make out who the bald man featuring in its poster was, accepting it frankly? So it obviously was quite shocking for me when at the Delhi Film Festival premiere, I was informed that one of my favourite actors Vinay Pathak is here too to grace the screening of his film GOUR HARI DASTAAN. His film? I was pretty confused ………..! But just in that moment when Vinay humbly waved from the back row with a smile, I shockingly realized that the unrecognizable bald person in the film’s poster was none other than the same funny man of films like BHEJA FRY, KHOSLA KA GHOSLA, DASVIDANIYA and the cunning, helpless villain in the recent BADLAPUR. Later the second pleasant blow of the evening came when I found that the film was not about snatching the freedom from the British or our struggle for independence before 1947. But instead it was all about an old freedom fighter humbly asking for his much deserved respect from the people of his own independent country, who have somehow gone blind and deaf in the ugly race of lust, greed and power in the last 68 years. And then the third unexpected surprise of the evening was the name of Konkona Sen Sharma playing Gour Hari Das’s old age wife giving him the much needed support and emotional warmth superbly. Becoming a strong USP of the film, GOUR HARI DASTAAN has no forced sarcasm, no artificial sequences and no politically motivated writing presenting the life story of an old man and his wife, asking for nothing but a TAMR PATRA (Official Certificate for Freedom Fighters)to live their remaining years with dignity. And watching the man running from one office to another smilingly looking at each and every person intentionally playing games with him hiding behind a corrupt system, one realizes that willingly or unwillingly I am too a significant part of this ugly mess prevalent all over the country, desperately in need of an ‘overall full body medical checkup’ at the earliest. Revolving around its main protagonist in almost every scene of the script, it was a golden opportunity for Vinay Pathak to make a major breakthrough from his set image of a funny man. And the actor successfully breaks that barrier delivering an outstanding performance as GOUR HARI DAS that is sure to impress both the critics and general public together. Particularly he just kills it in those silent moments when he is not giving any response and camera is only capturing his plain face with a faint smile as an answer. Certainly one of the best performances of his career till date and that too not as a funny man. Konkona Sen Sharma as his moral support plays it responsibly with all her slow body movements and dialogues adding a lot of love and meaning into their individual scenes. And Ranvir Shorey is once again quite impressive as the concerned journalist along with a whole lot of talent in supporting roles including Rajit Kapoor, Saurabh Shukla, Vikram Gokhale, Murali Sharma, Siddharth Jadhav and above all Vipin Sharma. Camerawork takes you into the world of Das brilliantly making a visual impact and music by renowned L. Subramaniam slowly reaches the heart along with the immensely meaningful silences placed in between. Following a focused vision, the editor keeps it short and simple within a 2 hours duration resulting in a moving film. And for this fabulous collective team effort, the credit entirely goes to the director Ananth Narayan Mahadevan having the vision of adapting the ‘still LIVE’ story for a film, taking it to the 120+ crores population of our country, who probably assumes that now there is no-one left alive from that generation who fought for our country’s independence before 1947. Mentioning the only drawback, I strongly felt that the film was so simply executed (exactly replicating the real life) that it might not be able to shake the hard stone-like mentality of the viewers (read masses) lost in their own individual world of ambitions. It softly depicts the life of Gaur Hari Das as he is in reality and therefore misses any powerful anger-filled moment that at once makes you feel the disgust for the people cheating him on the screen with no feeling of any regret or shame whatsoever. In other words, it’s a film about a strong man with a soft heart, who refuses to deal the constant rejection with any visible anger and thus misses that solid hard-hitting emotional punch, reminding you of the most famous scene of SARAANSH. 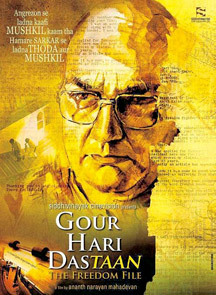 May be, in a different way this can also be considered as the major strength of the movie as GOUR HARI DASTAAN indeed is one of those rare films that forces you to sit back in despair and look into the mess we have made out of our 68 years old independence earned after uncountable sacrifices and decades of efforts made. Probably having a good sense of humour is the only way to continue living in the present social & political conditions of the country with a positive attitude as taught by the experienced Gour Hari Das. And the veteran surely needs to be given a big salute for a 32 years long fight with the corrupt, impotent system…….without a single fault of his. With a big thanks to both director Ananth Narayan Mahadevan and his producers for taking up this enlightening project, I would strongly like to recommend GOUR HARI DASTAAN to all like-minded friends of BTC. So do watch it as a must making an extra effort, even if it is being shown at a theater far away from your home at some odd timing……… and feel the guilt for being a part of this visibly corrupt system…… knowingly or unknowingly! Sometimes someone put a mirror in front of us and we are left ashamed of ourselves. It was indeed a shame to know how we treated one of our freedom fighters post-independence.. And one thought that is stuck in my mind is that – there must have been hundreds of such unsung heroes who were not given their due respect..
On the other hand, as you have rightly said it is the spirit, attitude and philosophy of this great man that turns out to be the key point of this movie. A Big Thanks to the entire creative team behind this project. Glad that you watched the film in theater Avik and liked it too.